These puff pastry turnovers are a cinch to make. Storebought puff pastry is cut into squares then filled with almond paste and mixed fresh berries. The tops are folded over, brushed with egg, and the pastries are baked to oozing goodness. 1. Preheat the oven to 400°F. Line a rimmed baking sheet with parchment paper. 2. If using Pepperidge Farm puff pastry, on a lightly floured work surface, roll out each sheet of puff pastry, 1 at a time, to an 11-inch square and cut into 4 squares for a total of 8 squares. Turn a pastry square so one corner is toward you and crumble 1/8 of the almond paste (about 1 tablespoon) over the bottom half of the square, leaving a 1/4 inch border along both edges. Top with 1/8 of the mixed berries and fold the top half of the pastry square over the filling to form a triangle. Gently but firmly press the edges together, crimp with a fork to seal, and transfer to the prepared baking sheet. Repeat with the remaining puff pastry and filling. If using Dufour puff pastry, on a lightly floured work surface, roll out the sheet puff pastry just a little to smooth any crease marks and cut it into 6 squares. Turn a pastry square so one corner is toward you and crumble 1/6 of the almond paste over the bottom half of the square, leaving a 1/4 inch border along both edges. Top with 1/6 of the mixed berries and fold the top half of the pastry square over the filling to form a triangle. Gently but firmly press the edges together, crimp with a fork to seal, and transfer to the prepared baking sheet. Repeat with the remaining puff pastry and filling. 3. Using a pastry brush or your fingertips, lightly brush the tops of the pastries with the beaten egg. Reach for a sharp paring knife and make 3 small slits in the top of each turnover. Bake for 18 to 24 minutes, until the turnovers are golden brown and the filling has begun to bubble. Let the turnovers cool on the baking sheet for at least 10 minutes. 4. Meanwhile, in a small bowl, whisk the confectioners’ sugar, butter, and water until smooth. Using store-bought puff pastry makes this a quick recipe that can easily come together while you're scrambling some eggs and making coffee. Before you even take a bite, the almond paste gives the pastry an intense aroma, and the berries and almond paste come together to make a flavorful filling that doesn't require a lot of effort. I weighed out a pound of mixed berries—blueberries, raspberries, and strawberries. I made everything about the size of the smallest berries, which were the blueberries. I cut the raspberries in half and diced the strawberries. A pound was plenty of berries. The beaten egg was a bit thick. I normally mix it with 1 tablespoon water, however, the beaten egg alone did brown up nicely on my pastries. If I were to make this recipe again, I would try putting the berries in first, then pressing a lesser amount of paste into a rough triangle to place on top of the berries. Then as it bakes, the paste would melt into the berries and not be clumped. The leftover pastries lost their crispness unless reheated in the oven at 350°F for about 8 minutes. When I discovered frozen puff pastry in high school, it was magical. There are so many things you can do with it. By buying puff pastry, you cut out so much prep time. I now use the Dufour brand because it is just healthier and tastes pretty good. (Nothing can truly beat homemade puff pastry but the time issue is always out there.) So, honestly, I was more than happy to try this recipe. The flavor was great—berries and almonds together and this was so easy to do. I adjusted the amount of berries because I was using a smaller puff pastry sheet and I thought it would be ok. Even with the reduced amount, it was way too much. I probably needed less than what I used. I ended up using around 8 ounces mixed strawberries and raspberries. I cut the strawberries into small cubes and cut the raspberries in half. The yield was 6 pastries and the squares were about 5-by-5 inches. Would I make this again? Using the Dufour brand, I would definitely make these again but with only raspberries and maybe throw in some chocolate. This recipe blew my mind and reminded me of the raspberry turnovers I used to eat from Costco in high school—only these were MUCH better! It was only my second time working with puff pastry but it was a lot easier than I expected. Basically, it's like using pre-made pie dough. Pay close attention to the defrosting instructions and you shouldn't have any problems. I used Dufour pastry so I only had one sheet which yielded 4 HUGE pastries. For berries, I used raspberries and blackberries. I didn't weigh them but 3 cups was a bit more than I needed or could stuff into the triangles. If you wiggle the knife a bit while cutting the slits, you will make sure to actually create a hole wide enough to let steam out. I've learned this the hard way while baking bread and always appreciate the reminder. I split open one of the pastries about 10 minutes after removing it from the oven and it was DIVINE. I wrapped another in foil to gift to a sick neighbor. I LOVED the almond paste and it was a delicious combo with both the raspberries and the blackberries. Overall, this was delicious and super simple to make. I wonder if the pastries really need the drizzle at the end as it was very sweet in the end. Next time I make these (and there will be a next time!) I'll try some with just the egg wash. Great recipe! Yummy, yummy, yummy. What a treat these homemade pastries are! Much tastier than any of their store-bought counterparts, these decadent pastries melt in your mouth. 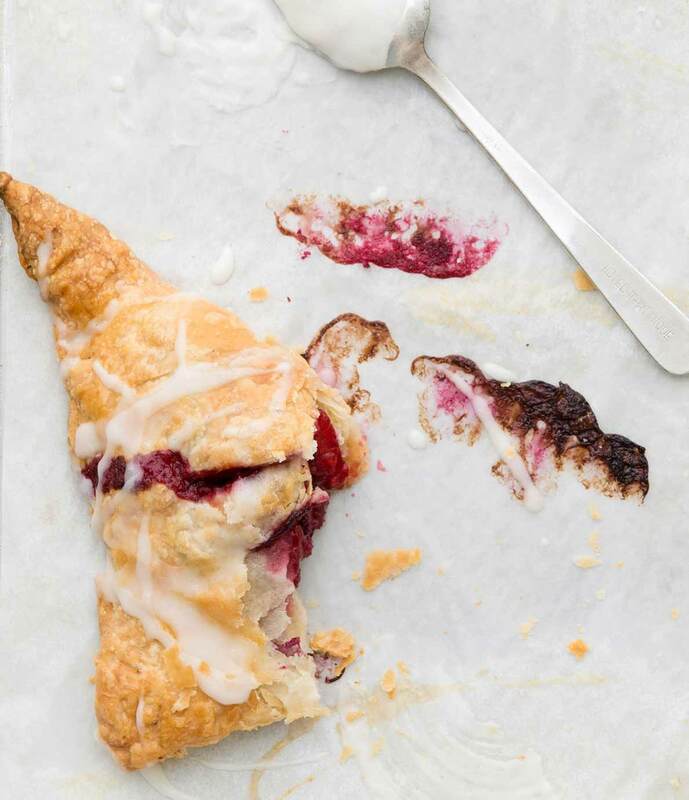 The almond paste and the berries melted inside of the buttery pastry dough very nicely—each bite had the warm, sweet taste of both fruit and almond. These were wonderful when served warm. I let the pastries rest for 10 minutes and the filling was still molten hot! My only suggestion was that I felt that using 3 cups berries really overstuffed each pastry triangle so the second time I made this recipe I reduced the berry amount to 2 cups and I decided to use raspberries. This was a fun recipe to make, and I could tell it would be even more fun to make with kids on a weekend morning when you have a bit more time. The egg wash really gave the pastries a lovely deep yellow color which was pretty. I baked the pastries for 18 minutes and they were cooked perfectly. We did have leftovers and I'm eating one now! I reheated the glazed pastry in a 425°F oven for just 2 to 2 1/2 minutes. It was a bit more soggy on top than the day before but still utterly delicious. This puff pastry turnovers recipe was easy and quick to make. I used raspberries and blueberries in my pastries. The almond paste I used was marzipan, which did not melt down very well but still added a nice sweetness to the fresh berries. I would make these again. I thought that if the icing was put on when the turnovers were cool it would stay in place better. 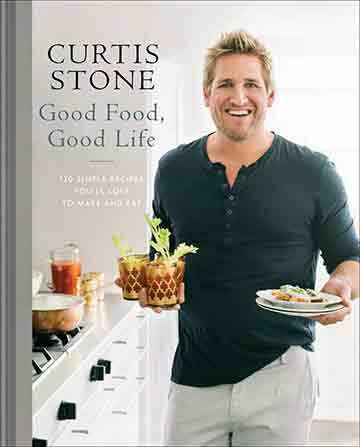 Puff Pastry Turnovers Recipe © 2015 Curtis Stone. Photo © 2015 Ray Kachatorian. All rights reserved. All recipes and photos used with permission of the publisher.